The following is the process which I used to install the K-box engineering kit for the leaking internal seal for my 91 Celica. *This process also works for the 3SGTE [and 3SGE I would assume] dist. If there is oil or oil residue found inside the cap for the distributor, chances are that you have a bad shaft seal. I have had this problem twice now. The first time I bought a rebuilt distributor for around $270. At that time, I did not know there were kits available to replace the seal. The following is an alternative and more cost-effective means to fix a bad seal in the 90-91 5S-FE Distributor. I'm attempting to write this for the novice mechanic so most of the procedure could be skipped for the advanced mechanics that regularly work on their vehicles. KIT#12311976 price is $19.99- includes shaft seal, shaft bearing, cap gasket and outer o-ring plus a kbox sticker. 1.Find a good place to work. Pop the hood and allow the engine to cool down prior to starting work. Disconnect the negative battery cable. Remove the air filter from the throttle body and move the throttle cable out of the way. 2. 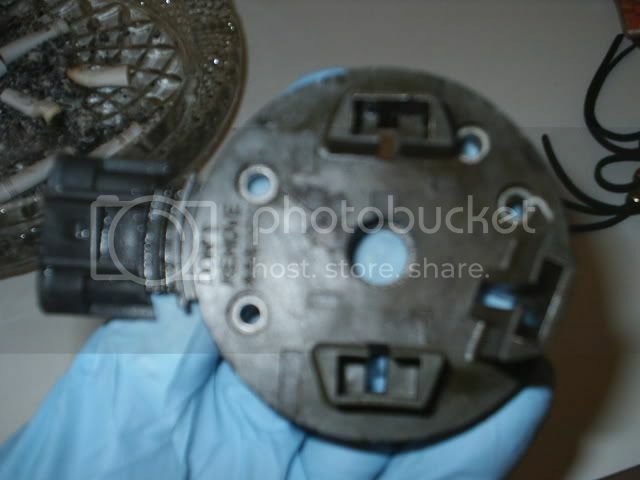 Mark the plug wires going to the distributor cap and not there position. The firing order for the 5S-FE is 1-3-4-2 in a clockwise direction. #1 being at the lower left position when viewing the cap from the driver’s side front fender. 3. Mark and remove the clip connector from the firewall side of the distributor base. 4. Using a sharpie or awl mark the position of the distributor timing to use for reference during installation later on. 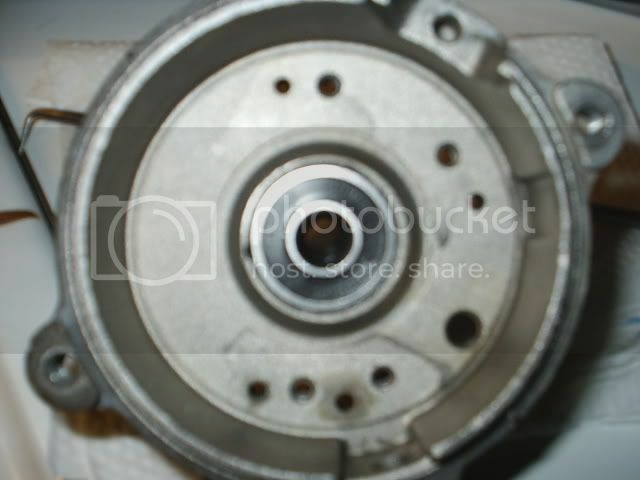 This is marked by making a line that goes across the distributor bolt and the distributor body bolt hole. down bolt and stage it for reinstallation. 6. Pull the distributor by the cap out of the cylinder head/valve cover. Place a clean rag or tape over the hole to prevent the entry of foreign materials into the cylinder head. 7. 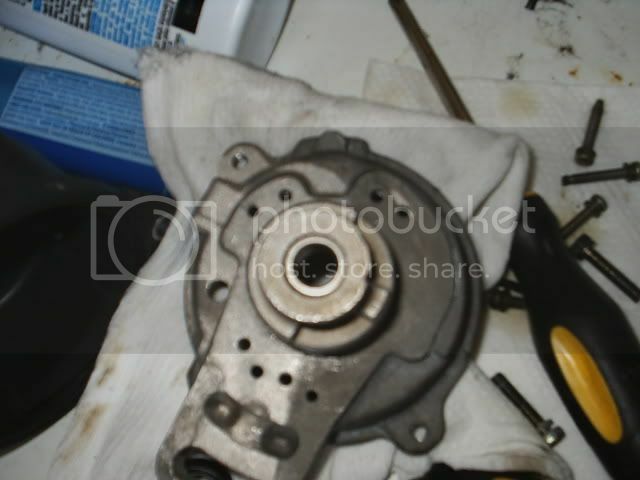 Wipe the distributor off and remove the o-ring located on the distributor housing. Be careful not to scratch or damage any of the seating surfaces. Use an o-ring removal tool or a wooden/plastic stick tool to lift the o-ring up and cut with a pair of scissors. Discard the o-ring in the trash. 8. Using a Phillips screwdriver or 8mm socket, remove the distributor cap screws and stage with the distributor hold down bolt. 9. Inspect the inside of the cap for oil and carbon dust. If the cap is dirty, remove the carbon brush in the middle with your fingers by gently pulling on it. There is a spring attached that should come out attached to the brush. Inspect the brush for signs of oil contamination. If it’s really saturated buying a new cap would be recommended. If it's in good shape like mine was use some 220 grit sand paper to remove just the shiny portion of the brush to give a clean contact surface. (We're only talking about a swipe or two of the sandpaper) Stage for installation later. 10. 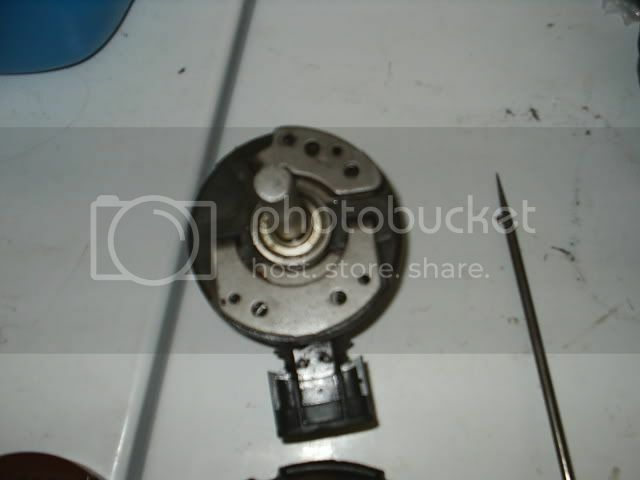 With a Phillips screwdriver remove the rotor from the distributor. Stage the screws for later and put the rotor with the cap for cleaning. 11.The rotor shaft and the pickups/stator plate are visible now. 12. Now using an awl or metal pick scratch a reference mark on the rotor shaft to one side of the shaft key (part that goes into the cam). This is critical because it's needed to correctly set the timing for the distributor. The key is offset to one side to prevent incorrect installation. 13. 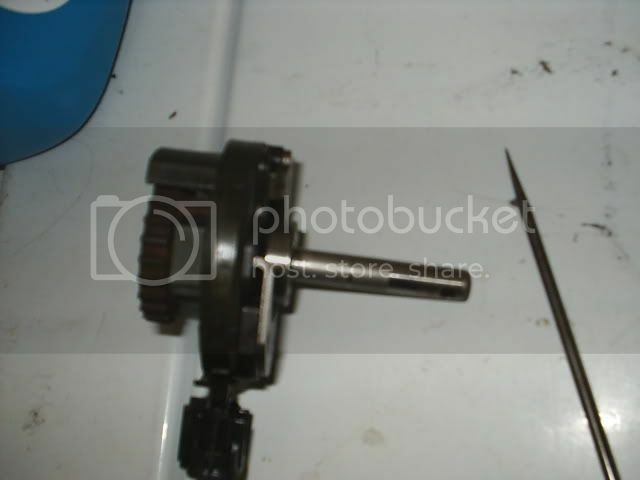 Using either a drill and drill bit or the method I used remove the pin from the shaft key. Inspect the pin and determine the easiest side to punch from. a. Place the distributor housing on a block of wood on its side. b. 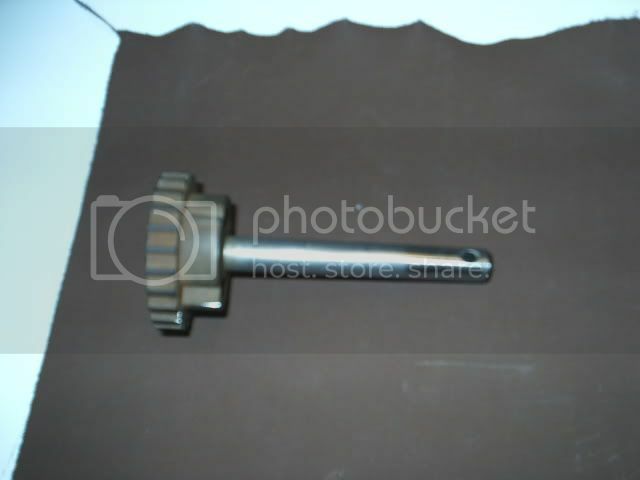 Place a small nut or similar under the shaft key/pin hole to act as added depth thru which to drive out the pin. c. Using the punch and a hammer punch the pin out of the shaft and shaft key. This took a while, as I was careful to keep the shaft and distributor solid to prevent any warping of the distributor rotor shaft. Use a nut that is thick enough to keep the shaft level and housing resting on the wood. If the pin mushrooms you will have to cut it clean or it will not go thru the all the way with out causing possible damage. 14. Remove the shaft key from the shaft and stage for installation. Discard the pin. A new one is provided in the rebuild kit. 15. 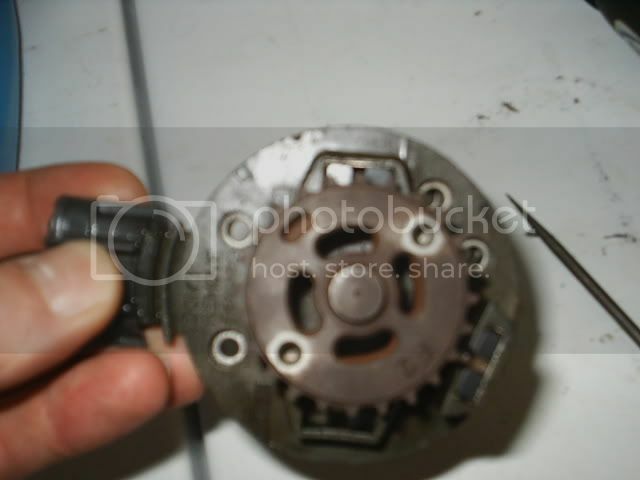 Remove the 4 Phillips head screws from the stator plate. These hold the plate in the distributor housing and set the distance between the rotor and the pick-ups. Put the screws with the rest of the hardware. 16. Now the rotor is free to be removed from the distributor housing. Press out the rotor from the engine side of the distributor by using a machine press or by tapping the rotor with a plastic or rubber faced mallet. Pull the rotor/stator from the housing. Set the housing to the side to clean. 17. Remove the seal from the rotor shaft and measure it against the new one in the kit to ensure they are the same. 18. Using a bearing puller or a shop press, remove the bearing from the rotor shaft. Check the bearing to the new one also provided in the kit. 19. Remove the rotor from the distributor stator. The tear down is complete. 20. Clean all parts and inspect for wear patterns and damage. Ensure the shaft doesn’t have nick that require sanding out and that the shaft is still true. I cleaned up the cap, rotor button and stator in electrical parts cleaner. Really nasty stuff! Wear a good pair of chemically resistant gloves (nitrile) when cleaning. Remove all magnets and poles and thoroughly clean off oil and dirt. Wipe off and let dry. 21. I put my stator in the oven to bake out oil that had gotten in the cracks caused by the oil leak and the fact that this was obviously reused during the rebuild process and not quality controlled as well as I would have liked. 22. Like I mentioned, I had cracks and they were repaired because I had to scrape off epoxy that didn’t work. Ended up using blue gasket sealer to fill in the cracks on my stator out of necessity, but if I had the opportunity to do it again I would use Philly bond or equivalent to seal it right. 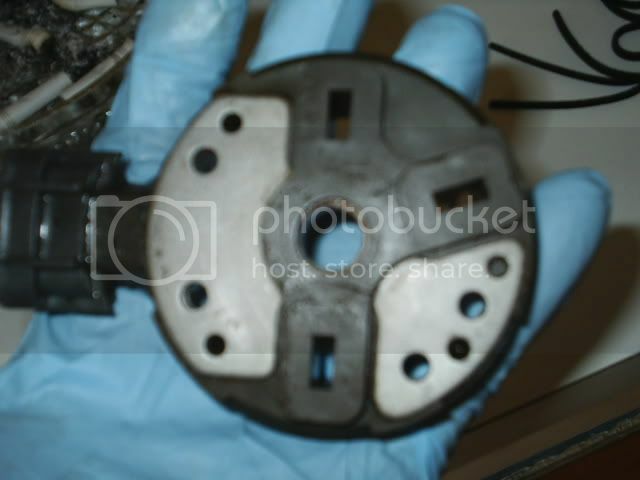 I never considered that there were cracks in the molded stator or that I received a $270 part with this condition. Now everything being clean and ready for reassembly we will begin to put things back together. 23. Now assemble all the parts on a table to aid in the assembly. 24. 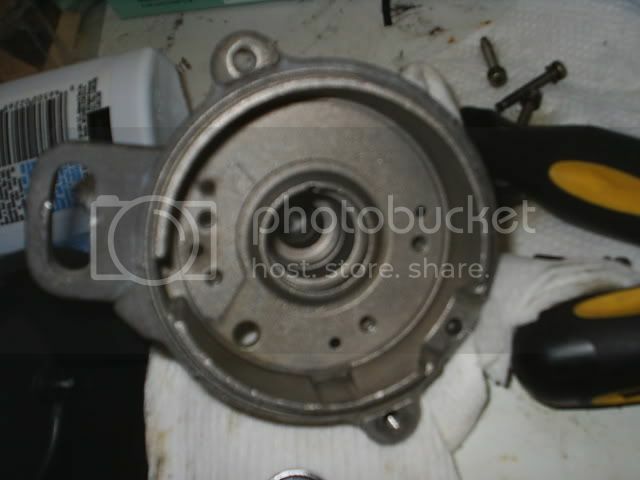 Take the housing and apply a light coat of new engine oil to the seals outer housing are seen in the pictures below. Lubricate the seal inner and outer lips with motor oil. 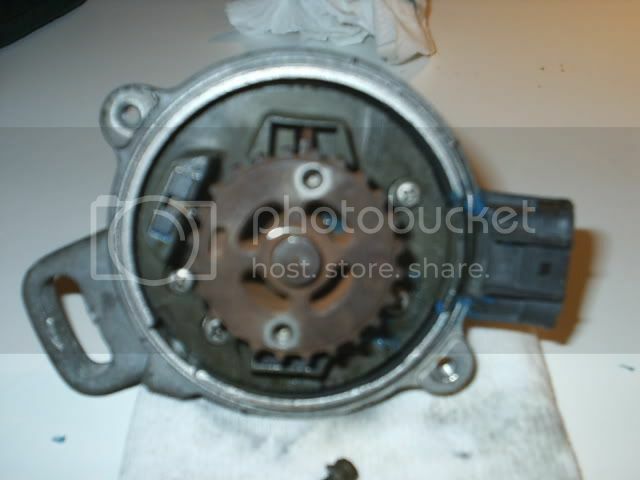 *Place the new seal provided in the kit into the distributor housing with the **open end*** (opposite the numbers)toward the engine side of the housing. Using a socket(5/8"spark plug) that closely matches the outer size of the seal and an extension, install the seal into the distributor housing firmly keeping the seal perpendicular to the housing and seat it flush into the housing. 25. Oil the bearing housing then use a socket, flat large washer or small piece of metal, and clamp press in the bearing for the distributor shaft using the same techniques with . Slowly tighten the clamp to press in the bearing. Carefully watch the bearing to keep it from becoming cocked in the housing. The bearing information should be facing you but it really doesn't matter as this is a typical convention for bearing installations. The housing should look like so. 26. Now place the shaft into the rotor stator( piece with the female wiring connector. Be sure the lettering is on the outside. 27. 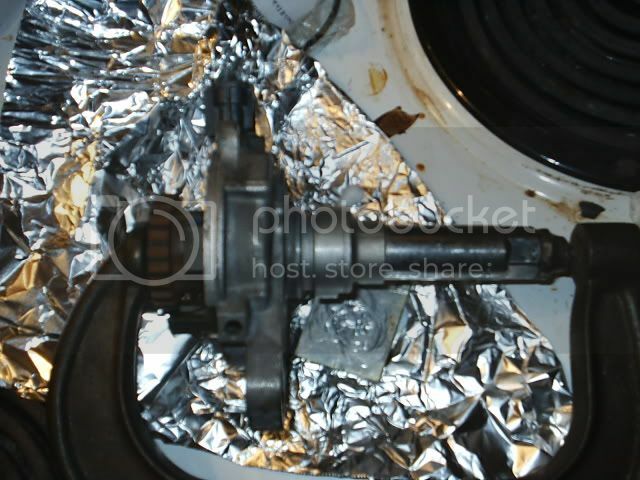 Oil the shaft busing on the engine side of the housing and the inner surfaces of the seal and bearing with motor oil. 28. Gently guide the rotor shaft into the housing and hand pres it in as far as you can. 29. 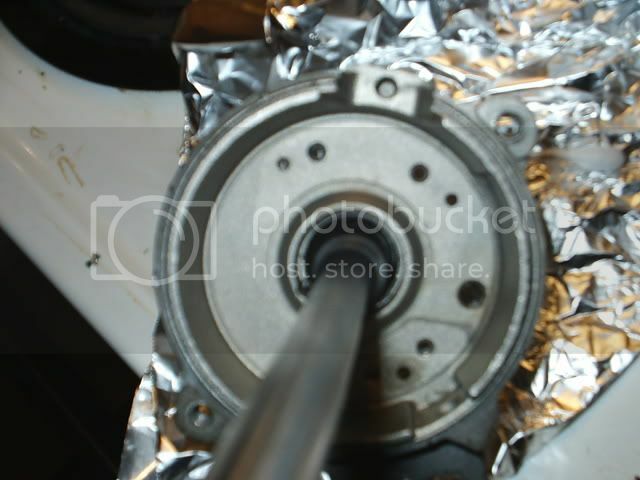 Take the clamp and using the spark plug socket, as shown in the picture press the shaft into place. Remove the clamp and socket and check for smooth operation by turning the rotor by hand. 30. Install the stator mounting screws and tighten hand tight. 31. Find the new pin and alignment gear and align with the marks made during disassembly. Punch the new pin into the gear and shaft. If you can't see the mark or forgot to do that step you can determine the correct placement by using a tie wrap to temporarily attach the gear and install into the valve cover/cam shaft end and see if the key lines up and matches at TDC with the rotor cap and distributor cap. If not turn the key 180 degrees and try fitment again. When you find the correct alignment punch in the pin with a hammer and wood block. Support the opposite end of the key with the block to provide resistance and prevent from warping the rotor shaft. 31. Re-install the distributor, restore the engine components removed for the repair and start the engine to test the distributor function. 32. Set the engine timing and tighten the hold down bolt. I hope this helps to alleviate the expenditure a few hundred dollars on a refurbished distributor as most of the components will last a very long time except for the seals and bearings. It certainly worked for mine and the same procedure will work on the 4A-FE as I have rebuilt it also. I have provided K-BOX with the parts for the IIA distributor on the 4A-FE and I believe they are the same bearing seal and pin.